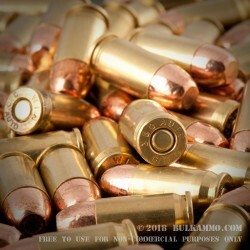 MBI or Military Ballistics Industries makes some of the nicest, best priced ammo on the current cartridge market. They produce specific ammo in various popular calibers and bullet configurations, available through companies like Bulk Ammo com. These .380 FMJ or Full Metal Jacket bullets are constructed with a cast lead core that is fully encased in a copper jacket. Each bullet is inserted into a newly manufactured, reloadable, high-polished, Boxer primed, non-corrosive, heavy-walled, yellow brass case. They come packed in a thick, clear, plastic, heavy-duty package that is sealed up tight for storage or training. 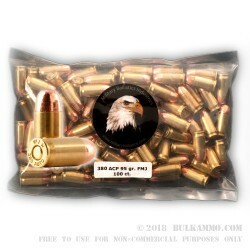 These rounds are available in these perfectly-sized 100 round packages with 10 packages per 1000 round case. These MBI .380 FMJ rounds are designed for shooting competitions, plinking with your buddies or your family, testing out new .380 ACP concealed carry platforms, and a variety of other shooting activities. Get yourself multiple packages today so you can use them tomorrow! Military Ballistics Industries is a newer heavy-hitter in the ammunition market. They have built their reputation by building high quality cartridges for U.S. Law Enforcement groups, Military, and Government Agencies. All of the rounds they produce for each group are built under Government contract. MBI only sells ammo to the above-named groups as well as licensed ammunition retailers and FFLs. They do not do retail sales to the general public.